The global diabetes devices market is mainly influenced by rising incidences of diabetes globally. This rise is attributable to sedentary lifestyle, high alcohol consumption, and stress. Increasing incidences has boosted the demand for diabetes devices from past few years. In addition, the cost-effectiveness of devices such as lancets, self-monitoring blood glucose meters, testing strips, and continuous monitoring devices is positively influencing revenue of the market. Rising awareness about therapeutics for diabetes and diabetes management among patients is bolstering growth of the market. However, rising number of oral drugs, supplements, and insulin pumps are major factors hampering growth of the market. Lack of awareness among patients in rural areas is hampering growth of the market. Nevertheless, continuous technological developments and advancements in the product is another factor expected to create potential opportunities in the market and continue over the forecast period. The report offers some interesting figures and facts related to the global diabetes devices market – it is recorded at the value of a US$37,220.8 Mn in 2016 with a CAGR of 6.7% expected to attain value of a US$66,053.1 Mn by the end of 2025. The global diabetes devices market report is segmented on the basis of product type and distribution channel. On the basis of product type, glucose monitoring devices, insulin delivery devices, diabetes management software, and artificial pancreas system. Further, glucose monitoring system is segmented into self- monitoring blood glucose meters, lancets, blood glucose testing strips, and continuous glucose monitoring meters and insulin delivery devices are segmented into insulin syringes, insulin pens, and insulin pumps. By product type, glucose monitoring systems segment is dominating the overall market owing to the preference for self-monitoring devices and cost-effectiveness of devices. Additionally, rising knowledge and awareness about advantages of self-monitoring blood sugar level is beneficial for growth of the segment. On the basis of distribution channel, the market is segmented into hospital pharmacies, retail pharmacies, online pharmacies, and diabetes clinics/ centers. Of these, hospital pharmacies are currently dominating the market in terms of revenue owing to high usage of these devices in the hospitals and pharmacies for quick results. On the basis of geography, the global diabetes devices market is segmented into North America, Europe, Latin America, Asia Pacific, and Middle East and Africa. Among these, North America is dominating the market with a share of 37.5% in the global revenue, followed by Europe with 34.4% of share. This growth is attributed to the availability of healthcare infrastructure and high government funding to offer advanced healthcare facilities. However, Asia Pacific is expected to witness faster growth in the global diabetes devices market owing to the factors such as rising health awareness, knowledge regarding different therapeutics, increasing the availability of healthcare services, and rising government funding to offer better healthcare services. 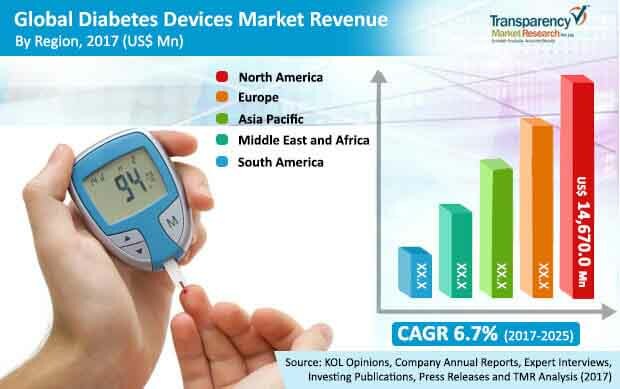 Some of the key players operating in the global diabetes devices market include Medtronic plc, Eli Lilly and Company, Sanofi S.A., Hoffmann-La Roche Ltd., and Novo Nordisk A/S, F.
This report on the global diabetes devices market analyzes the current and future prospects of the market. The report comprises an elaborate executive summary, including a market snapshot that provides overall information of various segments and sub-segments. The research is a combination of primary and secondary research. Primary research formed the bulk of our research efforts along with information collected from telephonic interviews and interactions via e-mails. Secondary research involved study of company websites, annual reports, press releases, stock analysis presentations, and various international and national databases. The report provides market size in terms of US$ Mn for each segment and sub-segment for the period from 2017 to 2025, considering the macro and micro environmental factors. Growth rates for each segment within the global diabetes devices market have been determined after a thorough analysis of past trends, demographics, future trends, technological developments, and regulatory requirements. A detailed qualitative analysis of factors responsible for driving and restraining market growth and future opportunities has been provided in the market overview section. This section of the report also includes market attractiveness analysis that provides a thorough analysis of the overall competitive scenario in the global diabetes devices market. Diabetes Mellitus is a chronic condition in which our body is unable to produce or utilize insulin for converting blood glucose into energy. Globally around 415 million people are living with diabetes. Half of the world’s population suffering with diabetes still remains undiagnosed. It is studied that 90% of diabetes cases are of type 2 diabetes. The diabetes devices market has a huge scope during the forecast period. The global diabetes devices market can be segmented based on product type, distribution channel and region. Depending on the product type the global diabetes devices market includes Glucose Monitoring Devices, Insulin Delivery Devices, Diabetes Monitoring Software and Artificial Pancreas System. The Glucose Monitoring Devices includes four main sub-segments viz. self -monitoring blood glucose meters, blood glucose testing strips, lancets and continuous glucose monitoring meters. Insulin delivery devices segment includes insulin syringes, insulin pens and insulin pumps. The Glucose Monitoring Devices segment is projected to be a highly attractive segment of the global diabetes devices market during the forecast period. The segment is anticipated to be expand at a CAGR of 6.7% during the forecast period. Self- monitoring blood glucose meters segment contributes maximum share to the global diabetes devices market in terms of revenue. High prevalence of diabetes due to factors such as lifestyle changes, high life expectancy and increased urbanization drives this segment of the Diabetes Devices market as people have become more careful about their health conditions and thus regularly monitor their blood glucose levels. Based on the distribution channel, the global diabetes devices market is segmented into hospital pharmacies, retail pharmacies, online pharmacies, and diabetes clinics/centers. The hospital pharmacy segment contributes maximum share in terms of revenue in the forecast period. Geographically, the global diabetes devices market has been segmented into North America, Europe, Asia Pacific, Latin America and Middle East & Africa. In addition, the regions have been further segmented by major countries from each region. The report also profiles major players in the diabetes devices market based on various attributes such as company overview, financial overview, SWOT analysis, key business strategies, product portfolio, and recent developments. Key companies profiled in the report include Medtronic plc, Sanofi S.A., Eli Lilly and Company, Novo Nordisk A/S, F. Hoffmann-La Roche Ltd.